On tuesday, it was public holiday due to Awal Muharam .We,dancemates decided to go to Midvalley and watch movies.Early in the morning,wake up at 8am and drive to Jalan Tun Sambathan which at Brickfields for a great breakfast. Smiles ;) we watched Unstoppable .. It's awesome! Very exciting and thrilling tee-hee! 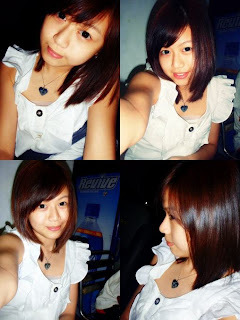 Yesterday,went to 1Utama with baby , mom and sis :) Well, i really did go to the saloon and chop my hair down :P It takes 3-4 months for me on thinking to cut my hair.Know why? because i had never have a short hair before. Was thinking that no harm on trying so ;D hair will grow too hahas. At night went to yum cha session. Will be leaving to east msia for dancing competition.Have to prepare now to the airport. Toddles! Be good to all my friends.